On Friday, March 1, a group of innovative Berkshire chefs will travel to the James Beard Foundation in New York City to present a farm-to-table dinner featuring foods harvested in the Berkshire region. 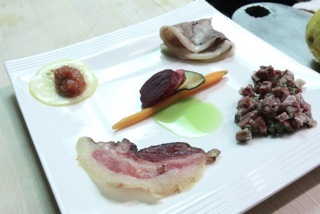 Organized by Brian J. Alberg, Executive Chef and Food & Beverage Director at The Red Lion Inn, this year’s event entitled “The Berkshire Cure-All” will be prepared with foods using time-honored curing and preserving methods. The James Beard House is known as New York’s best-kept gastronomic secret. Located in the former townhouse of celebrated cookbook author and television personality James Beard, the James Beard house is in the heart of New York City’s Greenwich Village. Over 20 dining events are held monthly to showcase culinary artists from around the world, featuring multi-course dinners with wine pairings prepared by guest chefs. “The Berkshire Cure-All” reception and dinner will include Stephen Browning, chef at Bell & Anchor (Great Barrington); Terry Moore, chef-owner of The Old Mill (South Egremont); Jamie Paxton, chef at The Meat Market (Great Barrington); Daire Rooney, chef at Allium Restaurant + Bar (Great Barrington); Dan Smith, chef-owner of John Andrews: A Farmhouse Restaurant (South Egremont); and Zee Vassos, chef at Firefly (Lenox). Red Lion Inn Sommelier Dan Thomas will craft elixir-themed cocktail recipes and select cure-all wines to accompany the dinner’s reception and six courses. The Berkshire region boasts a culinary movement characterized by a group of sophisticated chefs whose culinary styles are informed by the ever-changing bounty of New England’s seasons and the spirit of collaboration that pervades this close-knit group of farmers, producers and chefs. The unique culinary culture of the Berkshires has been shaped by an historical farming culture of dairy, orchards and raising animals on pasture — the county’s biggest “crop,” contributing to the year-round sustainability of the region’s farms. The Berkshires are known for rolling hills and fertile valleys; there are over 66,000 acres of farmland in Berkshire County, Mass. This will be Alberg’s tenth visit to the James Beard House and the fourth time he has invited a group of like-minded Berkshire chefs to collaborate and present the multifaceted culinary artisanship of the region. Alberg has been instrumental in galvanizing a Berkshire culinary movement – as a chef supporting local farms, as a farmer raising his own heritage breed pigs (Berkshire, Tamworth and Old Spot) at his Bacon on the Side Farm, as a mentor for youth interested in culinary arts and as President of Berkshire Grown’s Board of Trustees. The Beard House dinner will present the cuisine of seven chefs working in the verdant Berkshire region today. The “Preserving The Berkshire Harvest” reception and dinner is a collaboration among a variety of Berkshire chefs, farmers and producers. 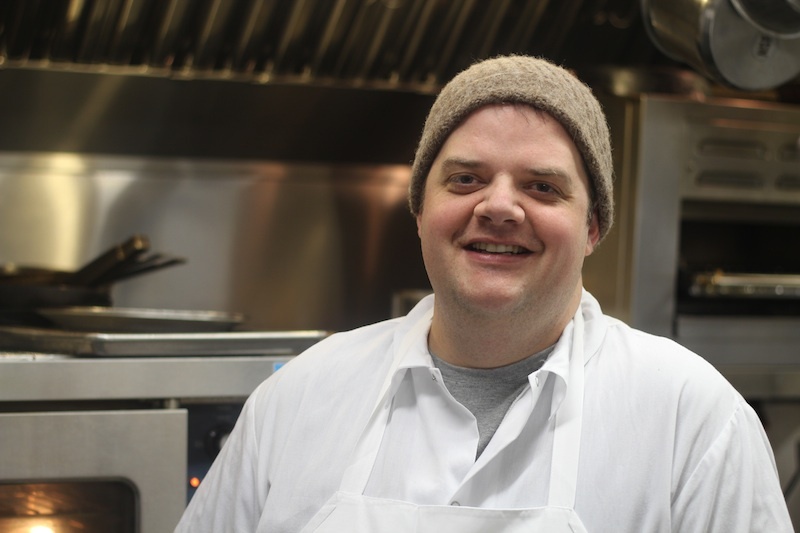 The participating chefs are: Chef Brian Alberg of The Red Lion Inn (Stockbridge, Mass. 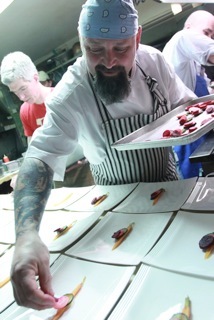 ); Chef Daire Rooney of Allium Restaurant + Bar/Mezze Restaurant Group (Great Barrington, Mass. 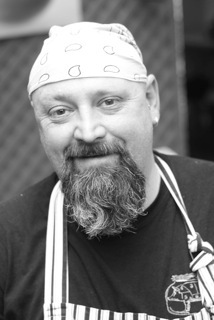 ); Chef/Owner Dan Smith of John Andrews (South Egremont, Mass. 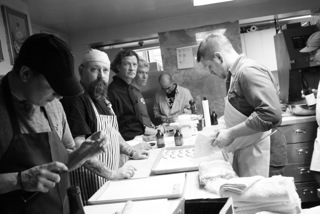 ); Chef Jamie Paxton of The Meat Market (Great Barrington, Mass. 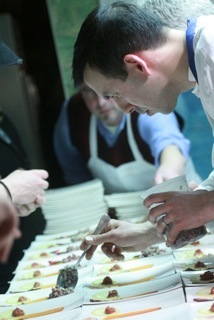 ); Red Lion Inn Sommelier Dan Thomas selected the wines that accompany the dinner’s reception and six courses. The chefs sourced menu ingredients from the Berkshires and Hudson Valley including Bacon on the Side Farm, Ancramdale, NY; Barrington Coffee Roasting Company, Lee, MA; Berkshire Blue Cheese, Great Barrington, MA; Berkshire Mountain Bakery, Housatonic, MA; Berkshire Mountain Distillers, Sheffield, MA; BerkShore, Northampton, MA; The Berry Patch, Stephentown, NY; Black Queen Angus Farm, Berlin, NY; Chestnut Hill Farm, Monterey, MA; East Mountain Farm, Williamstown, MA; Equinox Farm, Sheffield, MA; Farm Girl Farm, Egremont, MA; Foggy River Farms, Great Barrington, MA; High Lawn Farm, Lee, MA; Hilltop Orchards, Richmond, MA; Hudson Valley Foie Gras, Ferndale, NY; Kinderhook Farm, Ghent, NY; Lila’s Mountain Lamb (Lila Berle), Stockbridge, MA; Old Chatham Sheepherding Company, Chatham, NY; Shire City Herbals, Pittsfield, MA; Sol Flower Farm, Ancramdale, NY; Zehr & Sons Mushroom Farm, Ghent, NY. As a tie in to the “Cure-All” theme, The Red Lion Inn is partnering with Shire City Herbals of Pittsfield, MA, to present guests with a take-home gift of Fire Cider, based on the traditional New England cure-all of apple cider vinegar and honey. During cocktail hour, a Fire Cider Hot Toddy will be featured alongside a selection of sparkling wines to accompany hors d’oeuvres. 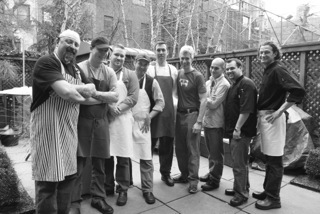 Beginning at noon on Friday, March 1, a team from The Red Lion Inn and Berkshire Farm & Table will provide behind-the-scenes coverage of Berkshire chefs in the James Beard kitchen, offering fans a backstage pass to this prestigious event. This year, media coverage will include blog posts, YouTube, Facebook and Twitter updates for up-to-the-minute storytelling as it takes place on-site in New York. 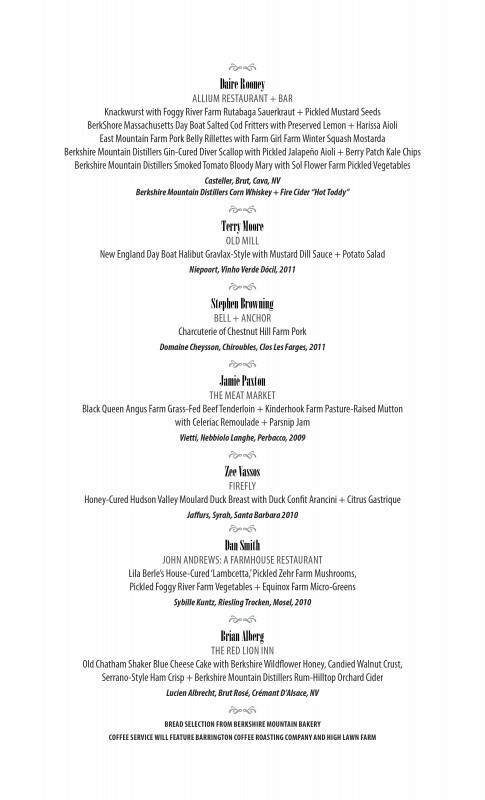 In celebration of this year’s event at the James Beard House, several chefs will feature their “Berkshire Cure-All” course back home in the Berkshires the week following the NY-based dinner. The Red Lion Inn, The Meat Market, John Andrews Restaurant, Bell & Anchor and Allium will participate with menu items or a slight variation of their Beard offerings. Details to come. The evening will begin at 7 p.m. with a reception in the Beard House’s charming Greenhouse Gallery as guests enjoy an assortment of hors d’oeuvres. A seated tasting menu will begin around 8 p.m. 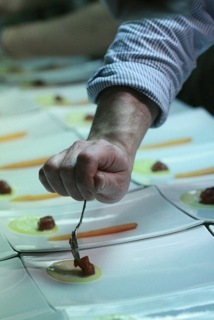 The price is $130 per person for James Beard Foundation members and $170 per person for the general public. The James Beard House is located at 167 West 12th Street. 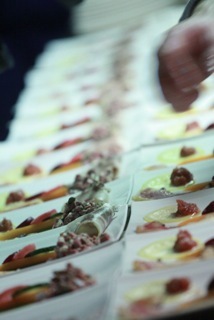 For reservations, please call 212.627.2308 or visit their website for event details. Small-town living, and its insular nature, along with a longstanding concern for the environment typical of people who work closely in it, has fostered a culture of sustainability that permeates life in the Berkshires. The region’s fertile valleys nurture over eighty independently owned farms that provide produce, meat, poultry, charcuterie, artisan cheeses and more. In particular, Brian Alberg’s buying practices have a direct impact on the community as he sources a large percentage of The Red Lion Inn’s menu ingredients through the Berkshire Grown network of farmers – contributing over $400,000 annually to the local economy. There is no better embodiment of the community’s commitment to the “buy local” movement than BerkShares, the region’s legal currency that is only accepted by local businesses (including The Red Lion Inn) – over two million BerkShares have been circulated since the currency’s introduction in 2006. Chef Brian Alberg is a native of Copake, NY, where he began his culinary career as an apprentice at the former l’Hostelierre Bressane. After graduating from the Culinary Institute of America in Hyde Park, NY, in 1987, he oversaw the kitchens in a number of high-profile Berkshire area restaurants, first as head chef at the Underhill Inn in Hillsdale, NY, and later at the 1780 Egremont Inn in South Egremont, MA, and the Old Inn on the Green in New Marlborough, MA. He left the area in 1993 to become Executive Chef at Dudley’s Restaurant in Westchester, NY, where he earned a “Very Good” rating from the New York Times and made his first appearance at the James Beard House. Alberg went on to work as executive chef and later Director of Food & Beverage at the Old Saybrook Inn & Spa, a AAA Four-Diamond property, where he was honored for the first time at the James Beard Foundation. Alberg then moved into the corporate world with Marriott where he helped open a number of hotels as well as create a Mediterranean menu with recipes and training information that was distributed to Marriott and Renaissance Hotels across the globe. Alberg began his tenure at The Red Lion Inn in July of 2004. He is a member of the James Beard Foundation and is President of Berkshire Grown, an organization dedicated to promoting the support of local farming and strengthening the relationships between local farmers and restaurants. He also serves on the board of the Railroad Street Youth Project, which provides young people with the opportunity to explore the culinary arts alongside a professional chef. Alberg was selected as the guest chef in the 2012 Outstanding in the Field Dinner at Indian Line Farm, the first CSA in North America, and took home top prize in Boston’s 2012 Lamb Jam. Alberg has appeared on Good Morning America, Chronicle, NECN’s TV Diner with Billy Costa, Albany (NY) News Channel 13 and WGBY’s On the Menu! (Springfield, MA.) 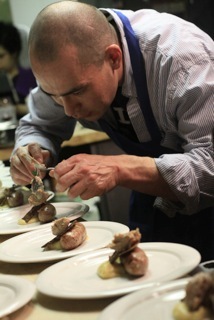 He has also been featured in The Boston Globe, Hudson Valley Magazine, Saveur and Gastronomica. Alberg resides in Kinderhook, NY. 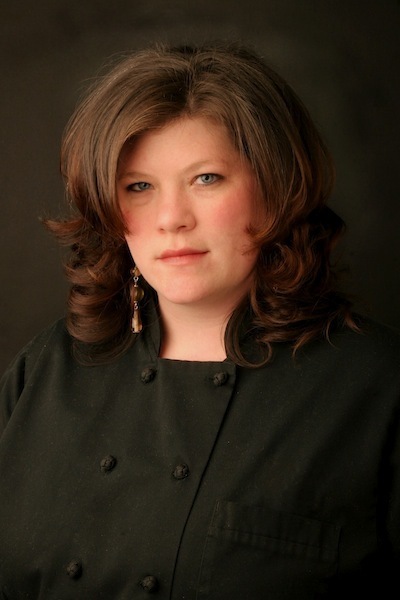 Daire has many years of experience working in kitchens across the East Coast of the U.S. She began her restaurant career at the age of 12, starting out as a busser and dishwasher. She moved into the kitchen and continued to follow her passion. In 2000, Daire became the Personal Chef and Head of Household to actress Meryl Streep and family. Daire relocated to Amenia, NY, in 2006 to begin planning and organizing the opening of De La Vergne Restaurant as Executive Chef. She stayed on developing the menu and back-of-house team for the first year and in July of 2007, took the position of Executive Chef at Brix Wine Bar, a 40-seat French bistro with an extensive wine list in Pittsfield, MA. In high season of 2010, she worked as Catering Chef with Mezze Catering + Events and in the fall of 2010, she moved to Georgia to take the position as Lead Chef at the Augusta National Golf Club, Home of the Masters Tournament, where she started the Greenhouse Program. 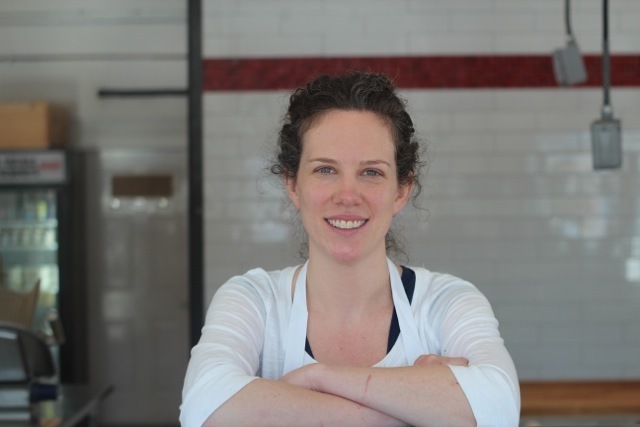 In addition to her restaurant and personal chef experience, Daire has taught cooking classes for the Railroad Street Youth Project and Different Drummer’s Kitchen, and has served as a board member of Berkshire Grown, a non-profit organization supporting local food and farms. 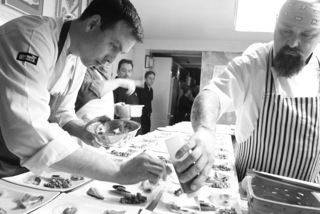 In the fall of 2012, Daire returned to the Berkshires as Chef of Allium Restaurant + Bar. She is passionate about using locally grown foods and heirloom ingredients to incorporate these into the dishes at the restaurant and is excited to relocate to the Berkshires to have access to local farms and food producers to create a seasonal menu that reflects our region. Stephen Browning graduated from the Culinary institute of America (CIA) in 2001. During his training at the CIA, Stephen worked an externship at the 21 Club in New York, where he later served as a Poissonier for one year. Stephen then took the position of Garde Manger and Patissier at Lutece, where he met future chefs and mentors Eric Lind and Eberhard Muller, owner of Satur Farms on the North Fork of Long Island. Stephen was hired by Eric Lind to be the Poissonier at Bayard’s Restaurant in NY, where Eberhard Muller was the Executive Chef. He was quickly promoted to Sous Chef. Crafting seasonal French fine cuisine, this is where he began cooking with ingredients from local farms, primarily using the chef’s produce from Satur Farms. Stephen opened Flatbush Farm Restaurant in Brooklyn and was the Executive Chef for three years. Using local farms and meat exclusively, he started working with whole animals and creating nose-to-tail dining for the restaurant. He then went on to work at his favorite restaurants, Marlow & Sons and Diner in Brooklyn, where ex-colleague Sean Rembold was Executive Chef. Stephen was Sous Chef for both restaurants in the mornings and in charge of their SummerStage concession in Manhattan during the concert season. 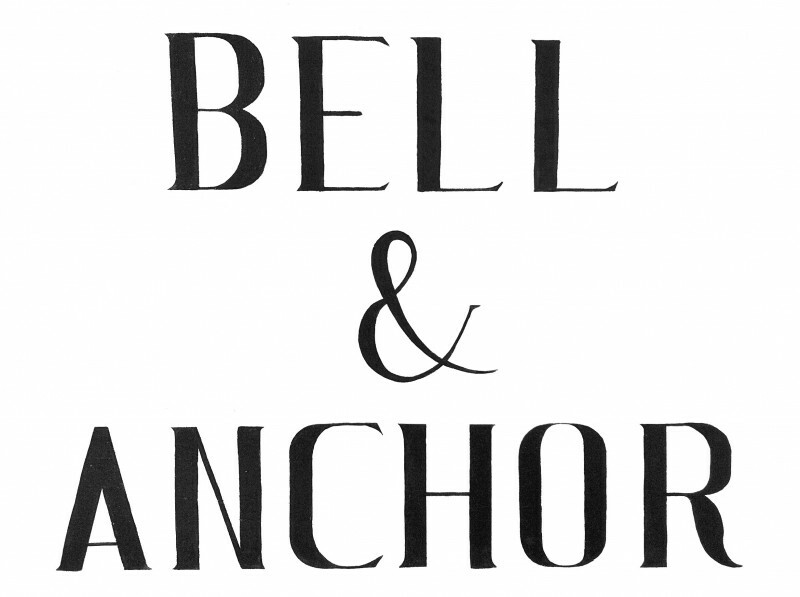 He met Mark Firth, then co-owner of Marlow & Sons/ Diner and current owner of Bell & Anchor. Mark offered Stephen a position at his new restaurant in the in Great Barrington, Mass. He fell in love with the Berkshires and the restaurant concept and they opened Bell & Anchor in September of 2012. Zee Vassos is the Executive Chef of Firefly in Lenox, Mass. His passion for food was stoked at an early age when, as a 14-year-old, he applied for a busboy position at The Roseborough Grill in the heart of Lenox’s famed Church Street restaurant district. Since then, he’s never looked back. From the front of the house to the back, Zee’s love of all things food was honed, sharpened and distilled while catering to the fine (and shrewd) diners of Berkshire County. While attending Boston University, Zee continued his culinary education as the Sous Chef for the Washington Square Tavern in Brookline. There, he developed a reputation as a creative and eager young chef. After graduation, Zee became the Culinary Director of Blue Moon Grocery and Catering where he was praised for his innovative seasonal menu design. In 2008, he was back in the kitchen as the Chef de Cuisine at the award-winning Chez Albert in Amherst, Mass. By 2010, Zee was lured back to Boston, where he served as the Head Chef of Bin 26 Enoteca on Beacon Hill and the Beacon Street Tavern in Brookline. Having proved his chops in the city, he returned home to the Berkshires in 2011 as the inspirational heartbeat and chef of Firefly. Zee’s latest culinary adventure will be the opening of his new restaurant The Kitchen on The Commons in Lenox in March of 2013. Dan Smith was brought up on a family farm in Iowa. His family has been farming for generations. Dan studied agriculture in college, but realized that his passion was not in growing food but in cooking it. 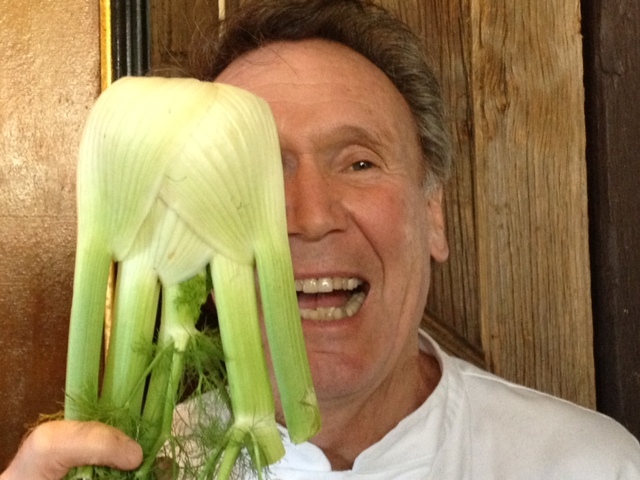 His connection to food comes from his experience of fresh food grown on the family farm. Dan’s longstanding connection to fresh, local food is rooted in his childhood, and is the basis of his menu at John Andrews. Dan is committed to buying local, organic, sustainable products. He has been working with local farmers for the last twenty years. 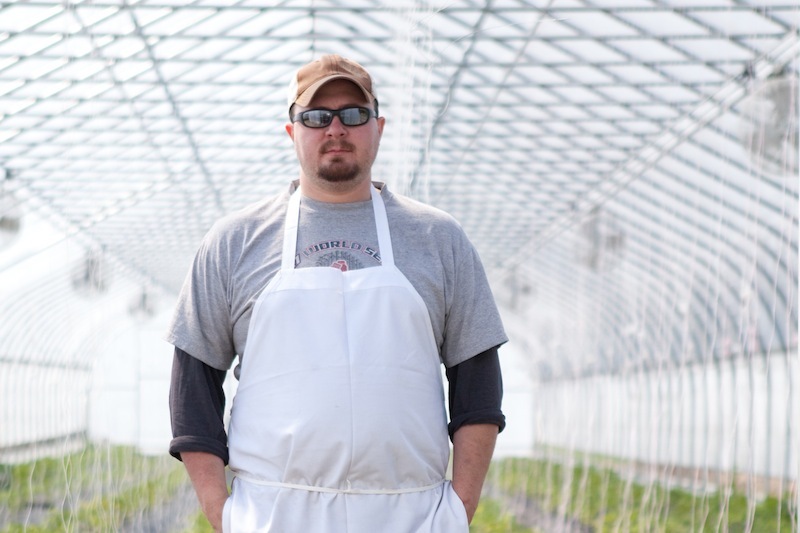 He works with area small farmers and producers to develop his menu around their products. He is inspired by the the produce they bring to his kitchen door. Dan treats ingredients and employees with respect to create a beautiful dining experience for his customers. Not only does he work with area farmers, he has also created his own garden on the property which supplies produce for the restaurant. 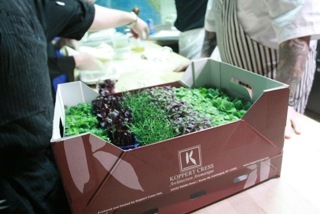 The commitment to local products and service is evident in the dining experience at John Andrews. A graduate of The French Culinary Institute and Duke University, Jamie found her way to the professional kitchen through many years of work in the restaurant industry and her personal pursuit of local and sustainable foods while living in Hoboken, NJ, and New York City. Her food is grounded in her French training, English and Irish heritage and her time spent living and traveling in Latin America and the American South, and driven by her interest in sustainable meat production, traditional food craft and local food systems. After graduating from culinary school, Jamie worked in the kitchens of Telepan and ABC Kitchen before leaving New York in pursuit of a life situated closer to farms, trees and fresh air. Jamie moved to the Berkshires in the summer of 2012 to join The Meat Market team and is thrilled to be living and working within this community of passionate and talented farmers and craftspeople. Terry Moore began his career in hospitality in 1960 aboard the Cunard Line’s Queen Mary. In 1965 he came to the U.S. from England, working in New York City, San Francisco and Las Vegas, mostly in front-of-house positions. He owned and operated the White Hart Inn in Salisbury, Conn., in the 1990s. 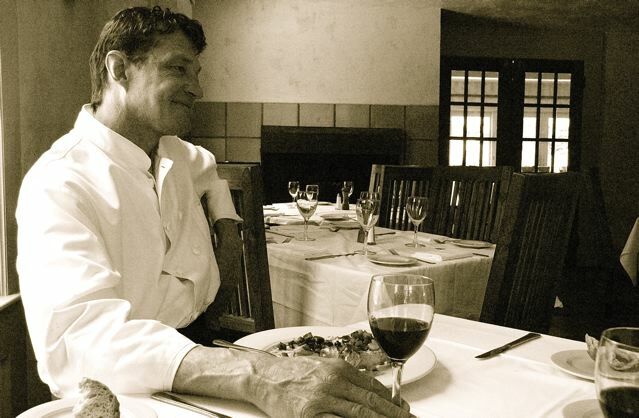 Terry opened The Old Mill Restaurant in the Berkshires in 1978 as the chef-owner and is still there, living happily ever after! 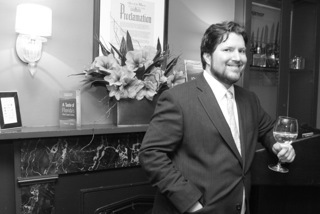 Sommelier Daniel Thomas brings extensive knowledge of oenology to The Red Lion Inn dining experience. Thomas completed the first level of the Court of Master Sommeliers and is currently studying and tasting in preparation for the next level of testing. He furthers his studies by participating in meetings of a tasting group of industry professionals as well as tasting over 500 wines each year through his own research and travels. Inspired by the advancements in food and wine over the last decade, Thomas most enjoys introducing guests to new wines, beers and cocktails along with unexpected combinations. On staff since February 2007, Thomas expanded the Inn’s wine list to include over 400 wines with a focus on artisan producers from around the world. The Red Lion Inn was awarded the Wine Spectator Award of Excellence for the twelfth consecutive year in 2010. A charter member of Historic Hotels of America and winner of the Wine Spectator award for over a decade, The Red Lion Inn (c. 1773) has been providing food and lodging to guests for over two centuries. With the addition of its ninth Village Guest House Maple Glen, the Inn offers 125 antique-filled rooms and suites, formal and casual dining with locally sourced ingredients, a gift shop featuring locally made items, a pub with nightly entertainment and a full range of amenities including free WiFi, a year-round heated outdoor pool and hot tub, and in-room massage therapy. The Inn is recommended by National Geographic Traveler, The New York Times and The Boston Globe. For more information, contact 413-298-5545, or visit www.redlioninn.com. The mission of the James Beard Foundation is to celebrate, preserve, and nurture America’s culinary heritage and diversity in order to elevate the appreciation of our culinary excellence. The James Beard Foundation offers a variety of events and programs designed to educate, inspire, entertain, and foster an appreciation of American cuisine. 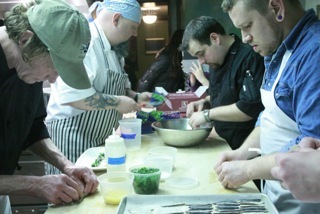 The events at the Beard House support foundation programs. The late James Beard was a champion of American cuisine who helped educate and mentor generations of professional chefs and food enthusiasts. Today, the James Beard Foundation continues in the same spirit by providing scholarships, honoring industry professionals, offering the public the opportunity to enjoy the talents of emerging and established chefs, winemakers, cookbook authors and purveyors, and hosting conferences, readings and classes to engage people with the fascinating world of food. 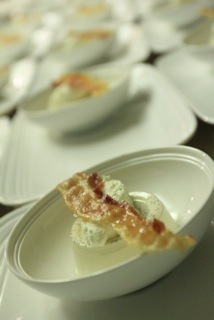 For more information about programs and membership, visit jamesbeard.org. 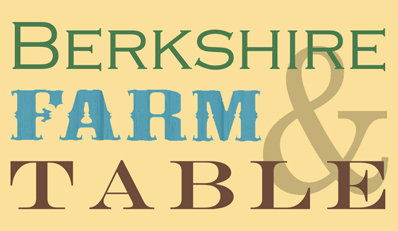 Berkshire Farm & Table is an organization whose mission is to cultivate regional economic development through the advancement of food culture in the Berkshires. Through building relationships, producing events and fostering dialogue, they bring the unique stories and expertise of Berkshires’ culinary artisans, farming values and agrotourism experiences to the forefront of the national food movement. For more information, visit www.berkshirefarmandtable.org.